The tiny coastal village was once an important Native American settlement. Submerged eight feet beneath the waters of Apponaug Cove, I could see about as far as my nose. Covered to the gills with scuba equipment and shivering from the cold, I swept my flashlight across the mucky abyss. What was I doing in water the color and opacity of thin pea soup? Looking for sunken treasures? Yes and no. On the dock eight feet above me, my father anxiously waited, not to see if I returned safely, but to learn if I had been able to find his car keys. Gliding through the water, all I could make out were alabaster-white shells scattered along the silty seafloor. It was a shellfish graveyard: deceased quahogs, long-dead scallops, departed oysters (gone but not forgotten). There was every variety of mollusk imaginable. I didn’t find my dad’s oh-so-important keys that day, but I did find the bits and scraps of Apponaug’s past. The story of these creatures is the story of this Warwick village. Long before people conceived of installing convoluted roundabouts, Apponaug was a major Native American settlement at the crossroads of two important footpaths, a focal point of indigenous traffic. Long after the Native Americans were forced to relocate, Apponaug continued to be a shellfishing hotspot. In the 1800s, quahogs and clams were plentiful and highly accessible. You didn’t need a spear, fishing pole, net or any other tool (although a rake always helped) to dredge up these flavorful victuals; all you needed was a willingness to dig through the mud. Apponaug native Oliver C. Wilbur, in an 1846 letter to his brother, waxed nostalgic about the town’s affinity for shellfish. 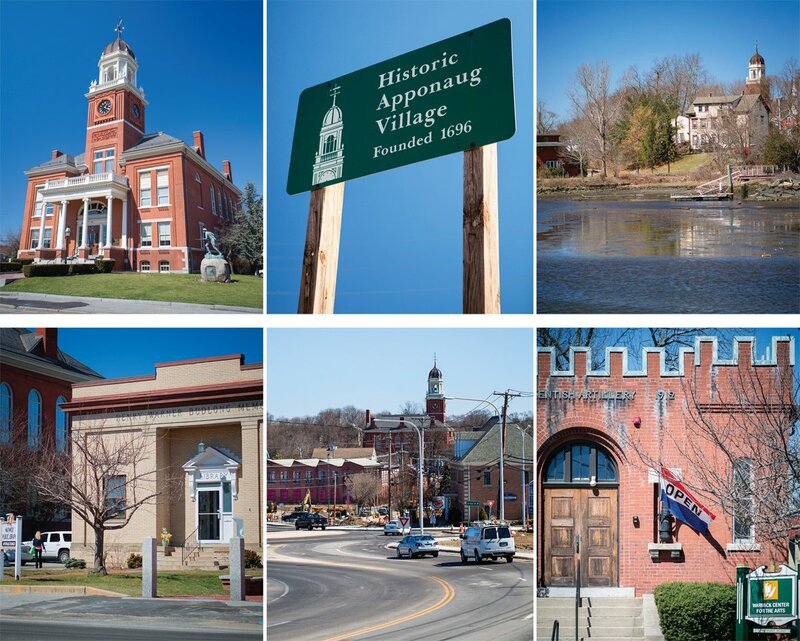 The Warwick Town Hall; a sign for the village; Apponaug Cove at low tide; the Warwick Center for the Arts, located in a historic armory; the recently constructed Apponaug circulator; the Henry Warner Budlong Memorial Library, a branch of the Warwick library system. Photography by Chris Vaccaro. This quahog-philia would continue well into the twentieth century. Judy Jencks, a longtime Apponaug resident and active member of the Warwick Historical Society (WHS), reminisces about her family’s involvement with shellfishing. She thumbs through an enormous binder full of faded maps, articles about the village’s history and old pictures of forgotten places and people. She stops on a blurry black and white photograph: A man stares confidently into the camera while perched atop a titanic mound of shells. A thick wooden mast juts in the background, and the fringe of a drooping sail is just visible. “Those boats were designed specifically for dredging oysters,” adds Felicia Gardella, president of the WHS. This type of commercial shellfishing was once a mainstay of the Apponaug economy, but now its importance is diminishing. 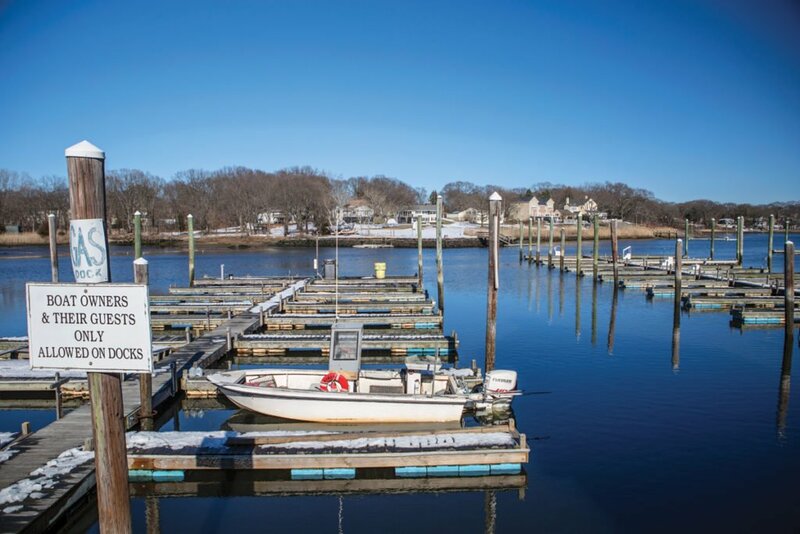 You can still see professional fishermen on the waters of Apponaug Cove in little metal boats, bobbing in the gentle waves. Their quahog rakes are submerged beneath the water, poles bent as they dredge the silt for all varieties of shellfish. But they aren’t the only ones still plying the cove’s plentiful waters. During the summer months, whole families can be seen wading into the waters at low tide, trowels and buckets in hand, ready for business. Parents point out to their kids the telltale signs of a submerged clam and how to dig it up. They eagerly tunnel down and uncover their prize from the same sand that yielded its treasures to Native Americans thousands of years ago, keeping the tradition alive. dot.ri.gov/news/apponaug; Warwick Preservation Report; preservation.ri.gov; Warwick Preservation Report; visitwarwickri.com/visitor-info.html.